Search for the best flight prices from Stansted to Malaga. Compare prices, book today and save money with Stansted Airport. 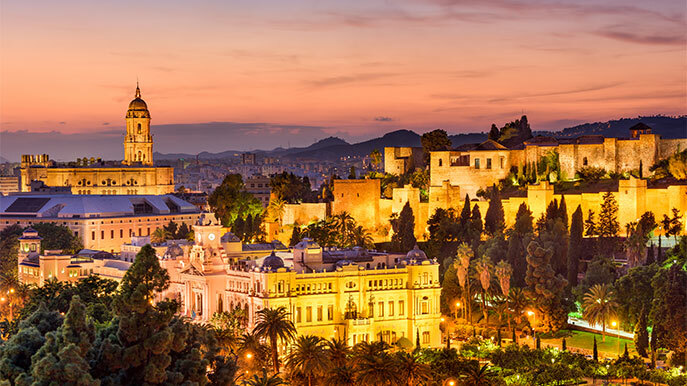 As the gateway to southern Spain the vibrant city of Malaga is well suited to its regular influx of visitors; responding beautifully with an excellent range of gourmet tapas bars and mouth-watering seafood. Accommodation is available to suit every budget, including some truly luxurious 5-star resorts, complete with rooftop swimming pool. But this sun-drenched paradise isn’t just a great spot for relaxing while you soak up rays on the beach, it can also make an interesting and engaging city break; with its rich culture and vibrant history providing plenty to keep the seaside sightseer happy. Malaga is not only a worthy destination in its own right, but also acts as a gateway to other spots in southern Spain. As a result it has a wide range of accommodation from cheap and cheerful hostels to more luxurious surrounds. One such high-end option includes the five-star Vincci Selección Posada del Patio (Pasillo de Santa Isabel 7), complete with 109 rooms and a great rooftop swimming pool, while the Vincci Málaga (Calle Pacífico 44) boasts four stars and a desirable seafront location. Lower budget choices worth a look are the Apartamentos Doña Elvira (Jinetes) and Apartamentos Marín 3 (Marín García), both of which are centrally located. Malaga is similar to other parts of Spain in that it’s notable for its leather goods, with Calle Marqués de Larios offering plenty to choose from. Located near the port, it is the main shopping strip where you can find well-known Spanish brands such as Zara and Mango, in addition to a selection of decent shoe shops. Take to the adjoining laneways that blend together independent stores and big labels, or if you prefer to cut down on the wandering then head for the El Corte Inglés department store (Avenida de Andalucía 4), where you’ll find everything from fashion to furniture, and food to perfume. Malaga is well renowned for its excellent seafood, which harmoniously compliments its superb tapas bars. Gourmet tapas is served up at places such as Gorki (Calle Strachan 6), while delightful seafood can be found at the Restaurante El Tintero (Playa del Dedo), which offers views of the beach. The Café de Paris (Calle Vélez Málaga 8) boasts a Michelin star for its inventive Spanish fare, while close to the Bull Ring you’ll find the Restaurante El Refectorium del Campanario (Paseo de la Sierra 36). When the three kings arrive at the port on 5 January, a letter requesting gifts for all of Malaga’s children is read to them by a youngster. The kings then lead a parade through the city streets, bestowing sweets and treats upon the children in the crowds as dancers, performers and bands whip up the celebratory atmosphere. Performers and costumed dancers take to the streets as the carnival’s parades make their way through the city, accompanied by traditional street bands, or murga. The customary ‘burial of the sardine’ on La Malagueta beach is the culmination of the ceremonies. One of Malaga’s most notable festivals, an array of colourful processions make up the annual Semana Santa. The procession of the palomas, or doves, which sees 100 of the birds released, is a highlight, along with the Good Friday Procession of Silence; which makes its way through the streets to the sole sound of a slow drum beat. Caricatures of public figures find themselves alight on a bonfire as the summer solstice is celebrated each year on June 23rd at midnight. As the pyre dwindles, revellers begin to jump across the fire amid plenty of dancing around the flames. This fair is a highlight of Malaga’s events calendar, and celebrations running through both the day and night. Expect lots of dancing, food stands, flamenco performances and entertainment for the kids.